New Old El Paso Coupon + Print Those April Coupons! Wow, can you believe April is over? I almost forgot to remind you all to print your Coupons.com coupons! There are several still worth printing if you haven't printed them yet, including a NEW .60/2 Old El Paso products coupon! Be sure to print 2 of each coupon you'll use! This will pair perfectly with the catalina deal running at all 3 of our local stores through 5/18: Buy 3 participating Old El Paso Products, get $1 catalina coupon back at checkout, buy 6 get $3 catalina coupon (good on your next order). Pay $1.02-$1.74, get a $3 Catalina back! Even if you have 2 coupons, pay only $2.02-$2.74 and get a $3 coupon back! Use these coupons on the other Old El Paso items that qualify for the catalina promotion and are on sale to score other great deals as well! These Old El Paso product sale prices are only good through Saturday at Cashwise and Sunmart, but extend through Tuesday at Hornbacher's! While you're at it, be sure to check Smartsource.com and RedPlum.com, as their coupons tend to reset at the end of the month as well. Aveda Stimulus Package - FREE at Participating Salons! I'm so excited about this freebie! Are you ready for a little free pampering? There are several salons in the Fargo Moorhead area that are participating. To find yours, go here. This is such a fun freebie, and the coupon doesn't expire til June 30th! Print it now, as it may not be available to print for long. For more info, check out the details here. There is no purchase necessary, but they do recommend making an appointment to use your coupon. Watch Food Inc for FREE Tonight Only! Have you heard of the movie Food Inc? If you've been curious to watch it, or if you'd like to see it again, today is your day! It's streaming for FREE here through midnight tonight! I love documentaries, and this one was right up my alley. It is a movie about where our "food" comes from, how it is produced and what it's really made of. I'd highly recommend watching even part of it tonight if you're able! For more info on the movie, head over here. 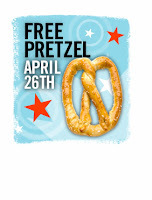 FREE Pretzel Day - Today at Pretzel Maker! Yup, you heard right, today is FREE Pretzel Day at Pretzel Maker in the mall! I checked the list of participating stores, and the West Acres Mall store is on the list -yeah! You can choose to sing for your pretzel or just ask for it. Umm, yeah. I'll just be asking for it. Thanks, Brandi for mentioning this on FM Cheapskate's facebook page! Fresh Strawberries (1 lb) FREE with in-store coupon and $25 purchase! Buy 6 taco seasonings at $4, get $3 back! Final price: $1 for 6 or .17 each! I don't see any great deals with this, but Old El Paso products are on sale this week. 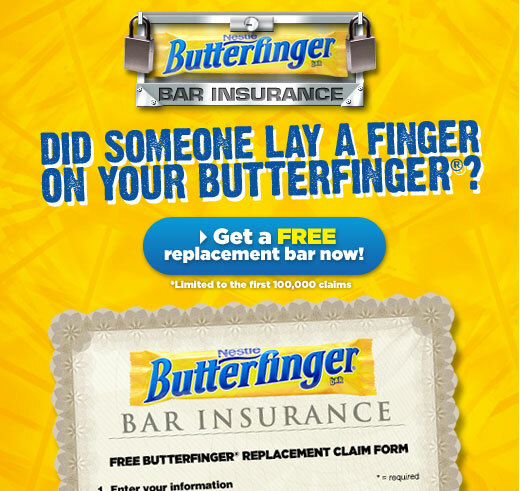 If you know of any coupons that could sweeten the deal, let us know! Head on over here to print coupon from Aero's website for $10 off a $10 purchase at Aeropostale, this weekend in-store only April 23-25. I'm thinking this could make for some inexpensive item of clothing or accessory! FREE Admission at Red River Zoo this Saturday! 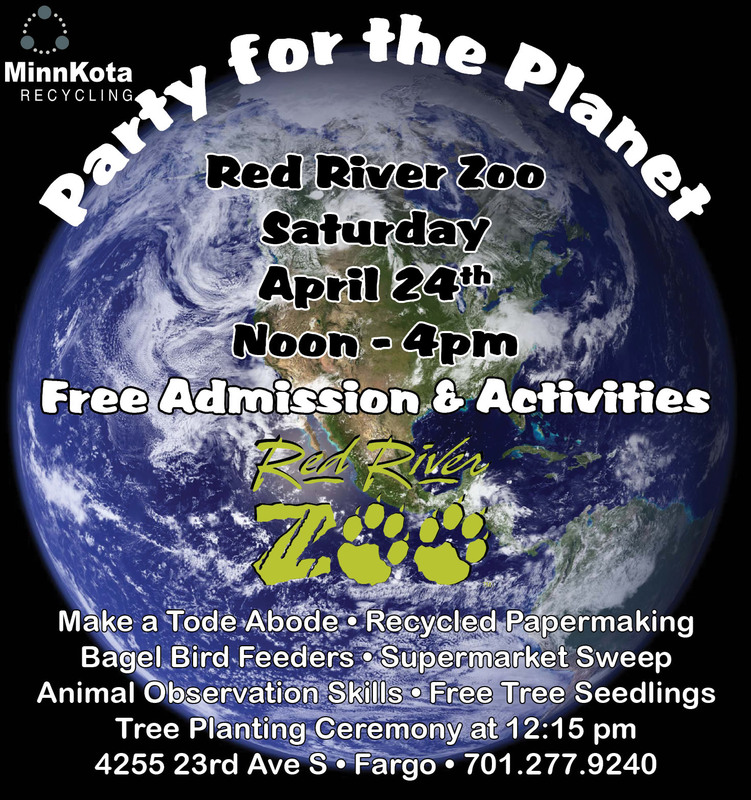 MinnKota Recycling is sponsoring a Party for the Planet at the Red River Zoo in Fargo tomorrow, Saturday April 24th to celebrate Earth Day! I think this is a great freebie, as Zoo admissions can tend to be pricey. The Zoo is open tomorrow from 12-4, and there will be free admission and activities, including free tree seedlings! 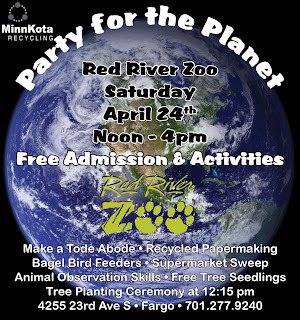 Visit the Red River Zoo's website here and bring your family out tomorrow! Hurry to Win a FREE Earthbound Farm Grocery Bag! Head on over here to take short quiz for a chance to win a sturdy reusable grocery tote from Earthbound Farm. Click on "Come into the Kitchen" to take the quiz. I love Earth Day freebies! I was at Moorhead Sunmart last night and found a SUPER fun clearance find (if you still have a VHS player)! There was an entire cart full of classic VHS movies, for $1 each! Now, we still have and use our tape player (I know...) so I picked up Casablanca, a classic. :) There was everything from Star Wars to Jaws. Sounds like they are getting rid of VHS in the rental area. Most Sunmart locations have a dedicated clearance/mark down area. If you're not sure, just ask! Earth Day Deal - $1 Ink Refill at Walgreens! I was so excited when I saw this Earth Day deal! Thursday only, April 22nd, get an ink cartridge refilled at Walgreens for only $1! I believe all 3 of our FM locations refill ink, and if you've never refilled ink at Walgreens before, plan to drop it off at the photo location and pick it up after at least an hour (if not longer, since I'm sure they'll be busy!) To be sure your specific cartridge is available, check here. Coupons are available in the weekly ad, which you can pick up in store or print here. This is a great way to lower your costs for printing coupons! FREE 7UP with this HOT $1 Coupon! Get it fast, the $1 7UP coupon is back! It usually runs out of prints very quickly! Remember to print 2 per computer. 2 Liters are on sale this week at Sunmart for .99, so FREE after coupon here! Dunn Brothers - BOGO Coupon! Are you a coffee lover? I've got a coupon for you - but only good through Sunday the 25th. 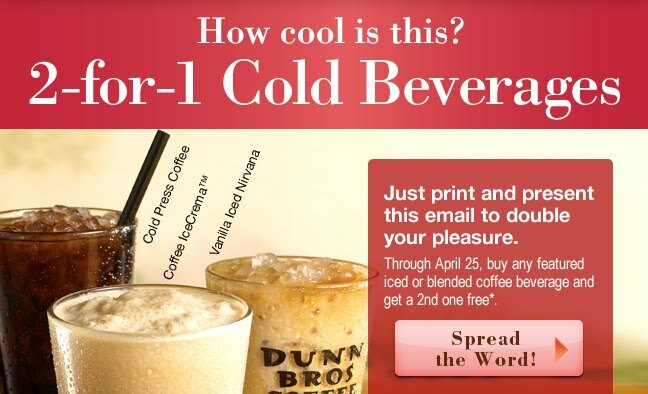 Head over here to print a coupon good at Dunn Bros Coffee for a FREE Iced or Blended Beverage when you buy one! Just today a friend was raving about the Iced Nirvana, here's my chance to give it a shot! This week only, through April 25th, Dairy Queen is having a special on Blizzards! Buy One, Get one for only .25! Awesome, I took advantage just today with a friend and our little ones! You don't need a coupon to take advantage of this deal, either. Love me some Mint Oreo Blizzard! And, thanks to all of you out there that sent this deal to me! Are you a True Blizzard Fanatic? While you're at it, you might want to head over here to sign up for the Blizzard fan club. Scroll to the bottom of the page to sign up, and receive 6 BOGO Blizzard coupons each year! Final price: $1.28 for 2! There are a few coupons available to use. And, if the Flatbread varieties are included, you can use the Buy 3, Get 1 FREE coupon or the Buy 5, Get a Breakfast FREE from the 1/10 SS. EDIT: Looks like the $2 coupon is for a larger size. It shouldn't be used on this 50 oz size. I'm totally hooked on Shop Like a Millionaire. Did you know that you don't even have to make a purchase to pick up a game piece? The rules state one per person per day, no purchase necessary. Just stop in and ask for one. Confession: I generally don't leave the house every day or I would stop by just for a game piece! :) Is anyone else playing the game? On to the deals. Looks like a pretty good week at Sunmart! Sold in 10 lb bags - this is a great price per pound on chicken, no coupon necessary. Final price: $1.69! Wow, a great price for organic milk! Check the Weekly Ad or the shelf to be sure this product is 4 oz or larger, first. I'm fairly sure it is, but the online ad is difficult to read! There was a .50 coupon in some areas in this weekend's paper, but I don't think we got it. Or maybe we did and I'm losing it? Today's Early Edition of the Star Tribune has both a Red Plum and a Smart Source insert! Looks like 2 good sized inserts. For a full preview, head over to Sunday Coupon Preview. Why does this Cheapskate buy the paper on Saturday? I like to get a deal, even on my coupons! Read more over here. These are advertised as Driscoll berries (or at least signage in the store said so) but there was another brand on the shelf when I was at Osgood Hornbacher's on Wednesday. I still have 2 .50 Driscoll berries coupons, and they expire at the end of this month, so if you come across Driscoll berries, come back and leave me a comment! Does anyone know of any other Ragu coupons out there to stack with this? Or, get them for FREE at Family Dollar! Sometimes my Catalina coupons double as well. So, when I use it, the .50 coupon doubles to $1. If this is the case, the pineapple is nearly FREE after coupons and catalina! Pay only $3.18, get $2 back. What other deals did you get at Hornbacher's this week? Moorhead Dairy Queen Tax Day Giveaway! Here's another Tax Day Freebie for ya! Moorhead Dairy Queen on 8th St and Main Ave is having a Tax Day Sundae Giveaway! Free sundaes tonight only from 8:30-10:30 PM tonight only. Head on over tonight and snag one! This Saturday, there are a few FREE family events going on around town that I wanted to highlight. First, the YMCA is hosting a Healthy Kids Day Community Event! At this free event your family can try the climbing wall, skatepark and XerZone and take part in activities to learn about gardening, farming, bike safety and more! Bring your bike and decorate it for a bike parade at 3:30 p.m.! For an event schedule and for more info click here. You can also click here to download a FREE Y Family Pass for use anytime through 4/30! What an awesome offer! With the Y Family Pass, you and your family have access to the XerZones, Family Climb, Family Skate, Family and Open Swim, Open Gym and Family Time in the Playstation! Saturday, April 17 from 11am to 1pm at Toys "R" Us in Fargo. A day of fun for children age 3 and up, including Thomas story time, games, trivia, coloring and free gifts. I haven't been to one of these, so I don't know that the "free gifts" are, but if you have a little on that loves Thomas (like I do! ), I'm sure it will be a great time! Whatever you choose, have a great weekend with your family! FREE Coffee at Starbucks - Tomorrow Only! Tomorrow, Thursday April 15th, bring in a reusable mug (doesn't have to be a Starbucks Mug) and get a FREE brewed coffee! Fortunately, we've finished our taxes just in time to get some sleep tonight, but hey - FREE coffee! For more details, head on over here. Tip: Bring in your reusable mug any day and get .10 off your drink! I've been at this about 6 months now and it seems like an appropriate time to share a little more about myself. I'm laughing a little, because I intended to do this a long time ago. But, now since this little thing has grown quite a bit and there are so many readers, I thought we could have a little fun with it. I get lots of questions by emails with questions and I respond to what I can, but I'd love to answer more questions about myself and what I do here at FM Cheapskate. Have a question about me or what I do? How I shop or anything else? I'm working on a short series of posts about FM Cheapskate and myself and would love to know what you'd like to know more about. Email me at fmcheapskate (at) gmail.com or use the link in the upper left hand corner of my site. Or, leave a question in the comments. Looking forward to sharing more with you! Oscar Mayer Weiners FREE with $25 purchase and in-store coupon! Final price: .96 for 2! This is one of my favorite sales on chicken - only $1! This is a stock up price on chicken for cooking, grilling and much more! Pay only $2.97, get $2 back. Check them out and print what you think you'll use. They are usually good for about 4 weeks. Plus, have you played the Shop Like a Millionaire game at Sunmart this week? Each time you go to the store, get a game piece (up to one per day per person - no purchase is necessary). Affix pieces to your game card in groups to win prizes! I love little things that I can cut out and do with my hands (I'm a dork, I know), so this game is kind of exciting. I'd liken it to the McDonald's Monopoly game. I just thought I'd mention it because there are also instant win pieces. For all the details and rules, head over here. I like to pay about $1/lb or less, but if you're itching for grapes, this is the best price we've seen in several weeks! Combine that coupons with the .75 coupon here and the $1 coupon here to get a great deal on chicken. The best way to maximize your savings is to buy many smaller packages and use a $1 coupon on each! Save your receipts for the Con Agra $25 Coupon book offer. Spend $10 before 5/30, get $25 in coupons. Get $2 coupon back at checkout. Final price: ? Not a stock up price, but a good price if you need cheese! If you were planning on buying OJ anyway, you can get an ok deal on cereal and some FREE OJ! Final price: $1.48 for the 4 cereals, plus FREE OJ! Did you find any other great deals at Hornbacher's this week? Let us know in the comments! Look for 2 inserts, a Smart Source and a Red Plum, in this weekend's paper. I've been out already and found both in my Saturday Star Tribune! (They're nice and big inserts, too!) For a full preview of the coupons, head on over to Sunday Coupon Preview. This is one of those days when "Show and Tell" is appropriate, I think. I don't know why it took me three days to figure out that Corn Flakes and Raisin Bran were both large enough to qualify for the Kellogg's milk Catalina that is still running through Saturday. I bought 4 Raisin Bran and 3 Corn Flakes. 2 cereals were .97, the others were $1.47, for a total of $9.29. I used 2 $1/2 Raisin Bran coupons and a $1.50/2 Corn Flakes coupon, all from the 3/28 RP. Received: 3 coupons for FREE Gallon of Milk. That’s money! Final price: $5.79 for 7 cereals, 3 gallons of milk and 3 super cute reusable bags! Now that's what I've heard called a "perfect storm" when it comes to couponing. An awesome sale price, high value coupons, a matching catalina deal and freebies thrown in! Final price: $4.79 for 7 cereals, 3 cool bags and 3 coupons for FREE milk gallons! These are stacked by the registers and are only while supplies last! For more on the Kellogg's cereal deal, see the full Sunmart deals list here. Also, the 25th St Sunmart in Fargo had 4% Cottage Cheese marked at only .99! I couldn't tell if this was a markdown just for this store, or if it's a price that is good at all stores. Using the .50 coupons here I was able to pick up 4 of these for FREE! If you're planning on heading out to Sunmart, you might print these just in case your store has them marked at .99 as well! Final price: .80 each after coupons when you buy 5! If you're already planning on buying $3 worth of produce, your final price will be only $5.88 for the produce and 4 cereals! New Ziploc Coupon for Catalina! Head on over here to print a coupon for .55 off any Ziploc Evolve. The best scenario would be to use these coupons at Cashwise, where Evolve bags start at $1.99. At Hornbacher's, I believe these start at $2.09 and I don't know the price at Sunmart. A great price without coupons, but there are a few to use to make the deal even better! EDIT: There are also $1.50/2 Corn Flakes 10+ oz and a $1/2 Raisin Bran 11.4 + oz coupons from the 3/28 RP that will work for this! Thanks, Suzette! Final price: As low .22 each, plus get a FREE Retro Kellogg's Reusable bag while supplies last! Most of these are too small to qualify for the Kellogg's Catalina I mentioned here. For that Catalina deal, I believe the cereals need to be 10+ oz. I always mention this sale, not necessarily because it is a great price on pork chops (more then $3/lb), but because this is a great week to shop the "reduced for quick sale" section at your Sunmart store. This meat does need to be used within a few days or frozen for later use. However, this is one of my best tips for getting a great price on meat. When these econopacks of pork chops go on sale 10/10, you can often find the 10 packs for as little as $6 (less than $2/lb) in the reduced meat section! EDIT: Nash Brother's coupon is down, but has been replaced with several coupons here, which expire 4/17 from what I can tell. Head on over here for the full preview! Let us know if you found inserts in today's paper or not! And, remember, in our area, this Cheapskate recommends buying the Star Tribune. Only .06 for all 4! Kmart is hosting a Super Doubles Event starting tomorrow, Sunday, April 4th! Since I don't normally post about the large chain stores here, I'm going to give you the basics of the Doubles Event and pass you along to My Frugal Adventures for the coupon match-ups. That means a $1 coupon will double to $2, and a $2 coupon will double to $4. If you have a $3 coupon, it will not double. Note: if you have a $2 coupon and the item costs $3.59, your coupon will only double to the price of the item, in my experience. Kmart is notorious for not advertising Doubles Events, but both Fargo and Moorhead stores are participating. To see if your store is participating, check here. It appears that Kmart is limiting you to 5 coupons per day. You can use more, but only the first 5 will double. If you don't yet have a Shop Your Way card, you can sign up in-store. They'll give you your card on the spot. In my experience, Kmart does not restock during the week. If there is something you're after, go with coupons in hand and shop early. I'm not sure why this Doubles Event starts on Easter Day, but stores will be open, apparently. And now, for the coupon match-ups. Head on over here where My Frugal Adventures has posted a deal list. Edit: Hip2Save now has a deal list posted over here as well! And, my best advice for Kmart is be patient and flexible. Hope you all find some great deals! Online Resources for Grocery Pricing! Two of the most helpful resources for me in trying to compile our local grocery deals are Hornbacher's Online Shopping site and CashWise Delivers, CashWise's online shopping site. Both of these sites allow you to search for items throughout the store and give you prices, show what varieties are on sale, etc. How great is that?! Wowzers! Has anyone noticed the price of a dozen eggs at Walgreen's this week? Eggs are only .59/dozen this week at Fargo and Moorhead Walgreen's locations! Limit 2. Maybe it's because Easter is coming up? Regardless of the reason, we had breakfast for dinner last night and probably will again soon. This is a great way to make an inexpensive meal! National Park Week - FREE Admission and More! To learn more about events at parks in our area, go here and search by state. Theodore Roosevelt National Park in North Dakota is hosting a Junior Ranger Day, which looks like it could be lots of fun for the little ones! It's April! Coupons.com has released several new coupons! I'd recommend printing any that you're interested in - often the good ones won't last! Remember you can print 2 of each, even though they often change pages after you print them. Head on over here to print them! I love FREE item coupons! 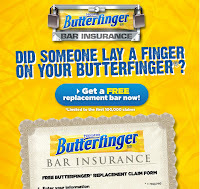 Head on over here to become a fan of Butterfinger on Facebook and be able to request a coupon for a FREE Butterfinger!